NBC — May 21, 1977 — 9:00-11:00 P.M. I was hooked the moment I opened the newsletter. Filled with a story synopsis, complete character and actor profiles, plenty of grainy black & white images, and a ton of merchandise for sale, Spectre was preaching to the choir. Billed as a classic horror supernatural drama, Spectre was everything I wanted in a prospective television series. I was a fan before I’d seen a single frame. I counted down the days until its debut… and then the unthinkable happened. I didn’t get to watch the show. My parents had us out that evening and we didn’t return home until 10:45. I raced to the television set and caught the final 15 minutes, cursing the gods for my fate. These were the days before video recorders and tivo and the like. There was no internet to turn to so as to catch what was missed. In a flash, it was gone and I was heartbroken. A short time later I stumbled upon the novelization by Robert Weverka in the now defunct Cole’s Books in the North Park Mall. My mother didn’t approve of my desire to purchase the $1.75 paperback thinking it too adult for her pre-teen son. I begged and pleaded to no avail. I went home with Conan the Buccaneer instead (thankfully she didn’t realize how adult those Robert E. Howard stories were, as well). Spectre, of course, was a ratings disaster and never went to series. Years later I did manage to catch Spectre during a late night showing and it was everything I’d dreamed it would be. Remembering the novelization, I began prowling used bookstores for a copy but it was elusive and I never was able to track one down. I kept my eyes peeled for it for decades. 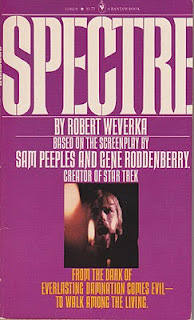 Here we are, more than thirty years later, and guess what… my lovely wife surprised me with the Robert Weverka Spectre novelization for Valentine’s Day. I was floored and my heart simply soared. It had been my holy grail of sorts for so long… and now, it’s mine. Needless to say, my wife has earned herself quite a few brownie points from her most appreciative husband. Now, if you’ll excuse me, I’ve got some reading to get to. William Sebastian, criminologist and occult detective, awaits.